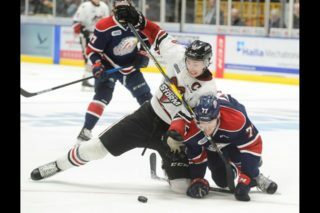 The Guelph Storm earned a second straight win on Saturday in a 6-3 contest visiting the Saginaw Spirit. Alexey Toropchenko was the game’s first star for the second time in as many nights with a goal and two assists, while captain Garrett McFadden was named the second star with one goal and one assist. Anthony Popovich got the nod between the pipes, turning away 33 of 36 shots in the win. At the other end, Saginaw’s Evan Cormier saw 40 minutes of play, allowing four goals on 20 shots, with Brendan Bonello finishing out the final period, stopping 12 of 14 Storm attempts. 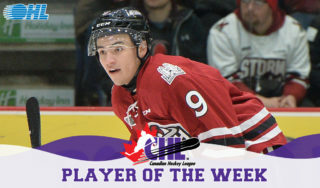 To start things offensively, Ryan Merkley fired a shot on net while on the man-advantage, to have Zach Poirier pocket his first of the season – and his first as a member of the Storm – off the rebound at the 14:51 point of the opening frame. The Spirit responded less than two minutes later with a Cole Coskey drive to the net, who put his third of the season past Popovich knotting the game up at one-a-piece. Moving into the middle frame, the Storm once again took advantage of the power play with Merkley adding his second assist of the game, finding McFadden rushing up ice who put a wrist shot past Cormier just over three minutes into the period. Isaac Ratcliffe extended the lead six minutes later with a swift wrap around behind Saginaw’s net, slipping the puck past the line for his second of the season. 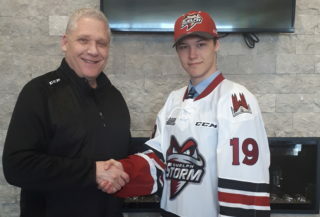 Exactly one minute later, Saginaw continued to try to claw back into the contest as Nicholas Porco scored the first of his OHL career off a scramble in front of Popovich to make it a 3-2 game. The game winner would be scored before the period ended though, with the Storm capitalizing on the man-advantage for the third time as Merkley found Toropchenko in the slot who made no mistake in putting up his fourth goal on the season. Cedric Ralph continued the offensive flare for the Storm, making it a 5-2 game 3:29 into the final frame off of a rebound courtesy of Dmitri Samorukov’s quick shot on net. Just under five minutes later, Barret Kirwin scored his first of the season to round out the goal scoring for the Storm, roofing a shot past Saginaw’s Bonello. In the final five minutes of the game, Saginaw added their third of the game from Ben Badalamenti but it wouldn’t be enough, with the Storm taking home a 6-3 victory. The Storm are back in action, returning home this weekend to host the Windsor Spitfires on Friday, and the Kitchener Rangers on Saturday. 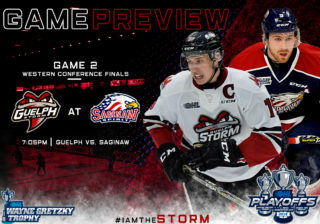 To get tickets to either game, click here, or call the Guelph Storm Box Office at (519) 837-9690. 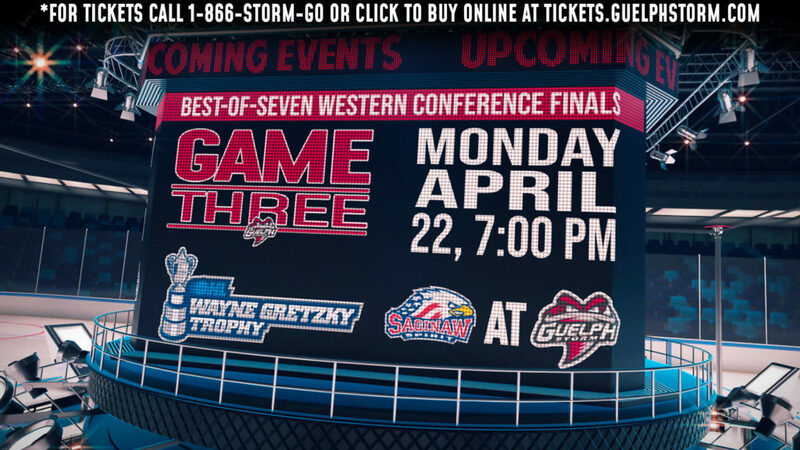 Tickets can also be purchased in person at the Guelph Storm Box Office in Old Quebec Street Shoppes. 1st Period–1, Guelph, Poirier 1 (Lalonde, Hotchkiss), 14:51 (PP). 2, Saginaw, Coskey 3 (Davis, Hill), 16:39. Penalties-Ralph Gue (tripping), 6:51; Davis Sag (interference), 9:04; Deakin-Poot Gue (hooking), 12:24; Busdeker Sag (boarding), 14:41. 2nd Period–3, Guelph, McFadden 2 (Merkley, Toropchenko), 3:36 (PP). 4, Guelph, Ratcliffe 2 (Toropchenko), 9:10. 5, Saginaw, Porco 1 (Crawford), 10:10. 6, Guelph, Toropchenko 4 (Merkley, McFadden), 18:18 (PP). Penalties-Porco Sag (slashing), 1:50; Toropchenko Gue (inter. on goaltender), 12:07; Grondin Sag (slashing), 17:37. 3rd Period–7, Guelph, Ralph 1 (Hotchkiss, Samorukov), 3:29. 8, Guelph, Kirwin 1 (Bertuzzi, Samorukov), 8:03 (PP). 9, Saginaw, Badalamenti 2 (Giroux), 15:11. Penalties-Bollers Sag (tripping), 6:27; Ratcliffe Gue (roughing, interference), 17:38; Grondin Sag (roughing), 17:38; Samorukov Gue (delay of game), 19:21. Shots on Goal–Guelph 10-14-14-38. Saginaw 11-10-15-36. Power Play Opportunities–Guelph 4 / 5; Saginaw 0 / 5. 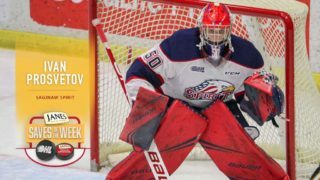 Goalies–Guelph, Popovich 2-1-0-1 (36 shots-33 saves). Saginaw, Cormier 1-2-1-0 (24 shots-20 saves); Bonello 0-0-0-0 (14 shots-12 saves). Referees-Joe Celestin (4), Brent Coulombe (22). Linesmen-Alex Ross (89), Tyson Baker (79).